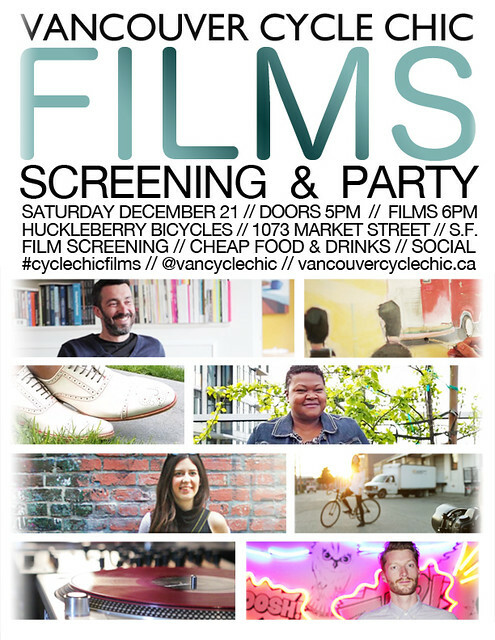 Earlier this year, Vancouver Cycle Chic produced a series of short films to highlight the diversity, creativity, and humanity of two-wheeled transportation, and inspire others to consider giving it a try. Producer Chris Bruntlett is in town for an exclusive screening and party at Huckleberry Bicycles, and to talk briefly about how and why they were made. Please join us for a drink, a bite, and a chat. Saturday, December 21st. Doors are at 5pm. Films start at 6pm.